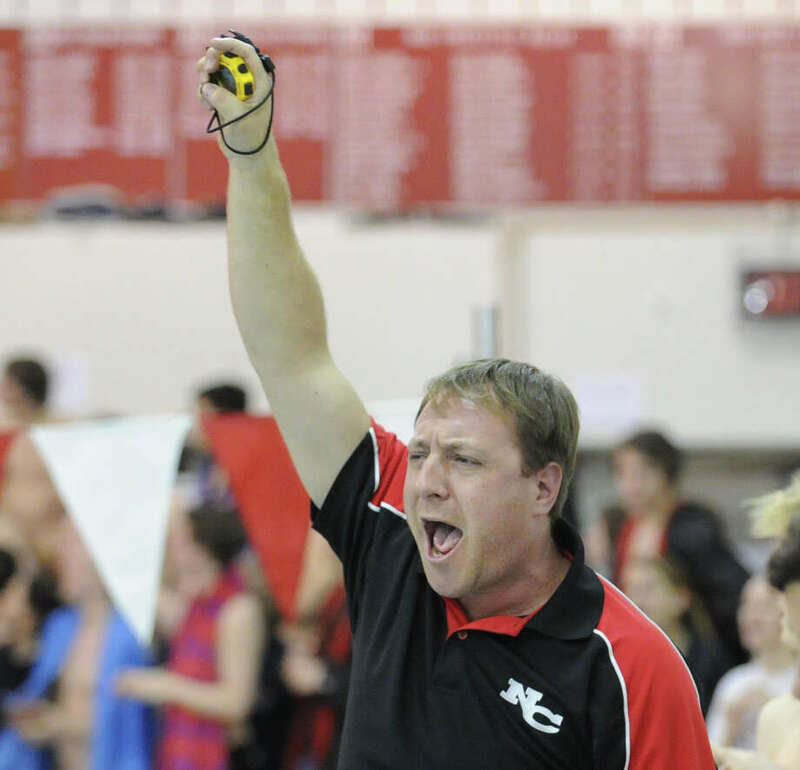 New Canaan swim coach Dave Fine during the FCIAC Swimming championships at Greenwich High School, Thursday night, Feb. 28, 2013. NEW HAVEN -- This is a tradition certainly worth repeating. The Darien High School girls swim team won their third consecutive State Open championship late Saturday night at Yale University's historic Kiphuth pool. Darien closed out its tour-de-force performance with 510 points to outdistance FCIAC rivals Greenwich (406) and New Canaan (404). "We talked on a bus ride up here and I asked the question `What do you want your legacy to be?' " said Darien coach Marj Trifone, who swam across all six lanes of the pool and back for a victory lap. "We had won the Triple Crown -- FCIACs, Class L or M and the State Open -- before. But this group also had an undefeated regular season. This is the first perfect record in Darien High girls swimming history." Cheshire (284) was fourth followed by Pomperaug (281.5) and Ridgefield (234). Weston (219) was seventh followed by Staples (215), Hall (199) and Lauralton Hall (193.5). Although Darien's roster of swimmers wasn't as deep as in its Class L victory, the Blue Wave contingent was determined to succeed. Senior Courtney Ferreira led the way for Darien. She won the 500-yard freestyle, was third in the 200 IM and swam anchor on two Blue Wave relays. "Courtney is so strong," Trifone said. "People look to her for leadership. When Courtney swims well, everybody picks up. To swim the 200 IM, 500 free and two relays is a tough task. And it was a great accomplishment for her." But it was a night where everybody needed to score for Darien to keep rivals Greenwich and New Canaan at bay. Greenwich's future is extremely bright since the Cardinals lose just four seniors and an impressive group freshmen who return next year. "It was Darien's year. They were the team to beat and they worked so hard to accomplish their task," first-year Greenwich coach Lorree Najam said. "I'm so proud of my group. They showed so much heart. They were phenomenal. We will miss our seniors because they gave such leadership to a very young group. But we're looking forward to coming back next year." For New Canaan, it broke a string of four straight years as State Open runner-up. "We won four events including the diving. No other team did that," New Canaan coach David Fine said. "Darien and Greenwich outswam us. I have no regrets. I couldn't ask for more from the girls. They maximized their potential." Ridgefield sophomore Marcella Maguire made her strong case for meet MVP by capturing the 100 backstroke in :55.27, just over the state open record of :55.11 held by Greenwich's Lauren Church (2011). The first turning point for Darien came In the marathon 500 freestyle. Ferreira won by two body lengths in 5:02.94. Wilton's Katrina Trentos was 5th with Pomperaug's Margaret Flaherty in sixth. After the 500 free (Event 8), Darien led with 310 points followed by Greenwich (260) and New Canaan (235). In the 200 freestyle relay (Event 9), New Canaan's quartet of Katie Colwell, Madeleine Smith, Caroline Sweeney and Meghan Egan won in 1:37.78. Darien's foursome of Belle Stobbie, Emily Nixon, Mckenzie Coughlin and Ferreira were second in 1:39.25. Pomperaug was third and Newtown fourth. In the 100 yard butterfly (Event 6), Staples junior Amelia Bullock won in :56.07 seconds. In the 100 yard freestyle, Ridgefield's Maguire dazzled, winning in a blistering :50.84. New Canaan junior Katie Colwell was second in :51.51 with Darien's Rutledge third in :51.67. Making Darien's victory more impressive was the first- and fourth-place finishes by New Canaan divers Kylie Towbin and Katie Kushner (55 points) at Thursday's State Open diving final. By contrast, Darien by contrast, did not register any points from the diving. Greenwich divers earned 26 points. In the meet-opening 200 medley relay, Lauren Rutledge swam a great anchor leg as Darien won in 1:47.16 with Ridgefield (1:47.90) in second place. In the 200 free, St. Joseph senior Jillian Rice won the third heat in 1:53.59 to finish second overall in the event. In the 200 IM, New Canaan's Egan won in 2:05.27. Darien's Ferreira was third in 2:06.33 with teammate Phoebe Slaughter fourth. In the 50 free, Ludlowe freshman Sarah Grinalds was second in 23.91 with Darien's Rutledge third in 24.15. After five events, including diving, Greenwich led with 202 points followed by New Canaan (184) and Darien (178).